Oasis at Palm Cove - The Oasis at Palm Cove has a number of guests facilities and services including Child Minding, Direct Internet Access, Faxing Facilities, Free Car Parking, Massage, Secretarial Services, Spa, Outdoor Swimming Pool, Tennis Court, Tour Desk, BBQ, Garden, Airport Shuttle, Cots Available and Babysitting Service which will make you feel right at home the next time that you stay. Oasis Palm Cove Australia is twenty minutes North of Cairns International Airport offering a unique mix of casual ambience and world class facilities in the picturesque beachside village of Palm Cove. 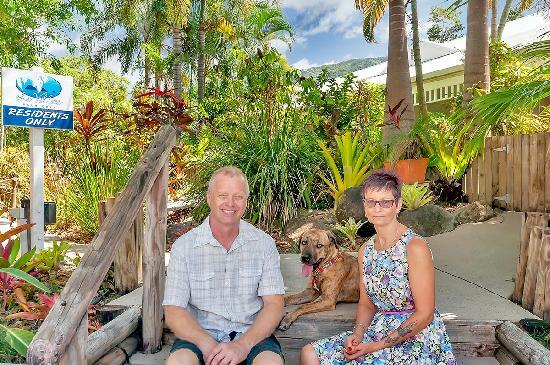 Nearby Attractions : 80 metres from the beach, 150 metres from Palm Cove village, Great Barrier Reef Tours depart from Palm Cove jetty which is a 5 minute walk away, Skyrail Rainforest Cableway, Championship golf courses at the Paradise Palms and Novotel. The Villas Palm Cove - Quality 1, 2 and 3 bedroom apartment accommodation in Palm Cove which is only a 20 minute drive north of Cairns in Far North Queensland. Choose from a range of fully furnished apartments that can easily accommodate couples and families in comfort and style. The Villas Palm Cove is a resort set in lush tropical gardens with a mountain back drop and only a short stroll to the beach, all our villas are spacious and fully self contained either 1, 2, 3 or 4 bedroom villas with full kitchen facilities and laundry, A/C, ceiling fans, and fly screens, DVD players, wireless internet, Austar TV and single lock up garage it makes for a relaxing holiday either with family and friends or a romantic getaway with all the comforts of home. Nearby Attractions : Great Barrier Reef, Palm Cove beach & esplanade, Restaurants and local cafes. Fishing from Palm Cove Jetty, Daintree Forest, Ride the Kuranda Scenic Train and/or Skyrail, Palm Cove & Paradise Palms golf courses located nearby. Kayaking, White Water Rafting, Ballooning and Horse Riding, Animal Wildlife Park, Night Zoo and Crocodile Adventure Park also located nearby. Reef House and Spa Palm Cove - The Reef House & Spa Palm Cove maintains the relaxed feel of small, sophisticated hote but offers fully self contained apartment accommodation in tropical North Queensland. 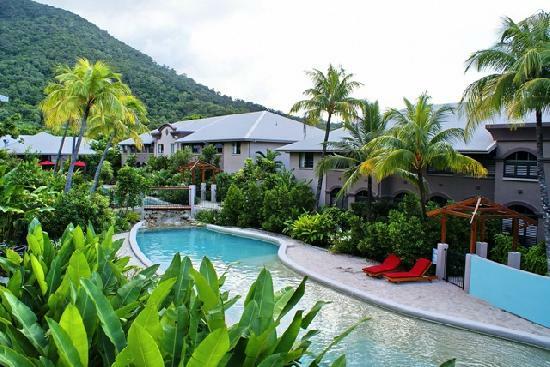 The The Sebel Reef House and Spa Palm Cove provides both holiday makers and business travellers with discount accomodation. This Palm Cove accommodation features modern amenities and is close to everything that the city has to offer. 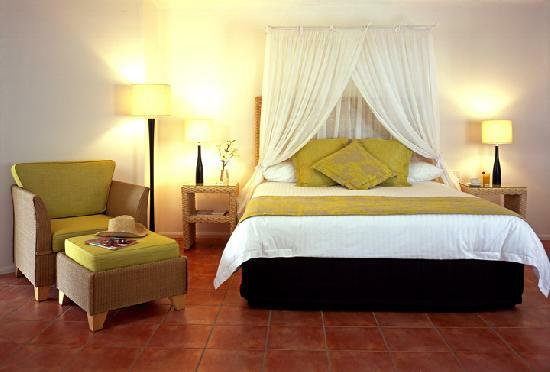 The Sebel Reef House & Spa is a boutique beachfront resort with a sophisticated yet relaxed atmosphere. Nearby Attractions : Great Barrier Reef and Daintree Rainforest. Palm Cove Serviced Apartments - For discount luxury apartment accommodation in Palm Cove stay at the Palm Cove Serviced Apartments. Offering relaxing studio, 1 and 2 bedroom apartments accommodation in a fantastic, holiday beach setting. Great value apartment accommodation for families and couples looking to relax and unwind. 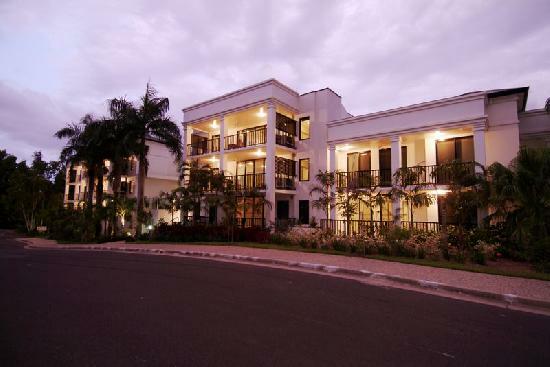 Relax and rejuvenate your body, mind & spirit at the beautiful Palm Cove Serviced Apartments at Mango Lagoon Resort. Nearby Attractions : Enjoy the local dining in a variety of bars, cafes and resort restaurants all within walking distance. Sign up for a guided bush walk, enjoy a plethora of water activities, play a round of golf or just laze by the beach. The on site 150 metre cascading lagoon style swimming pools, caters for everyone and creates and ideal location to simply relax and unwind and lounge around in total tranquillity. Palm Cove Tropic Apartments - Luxury 1 and 2 bedroom apartment accommodation in Palm Cove on Queensland's tropical northern beaches is what is offered by the Palm Cove Tropic Apartments. 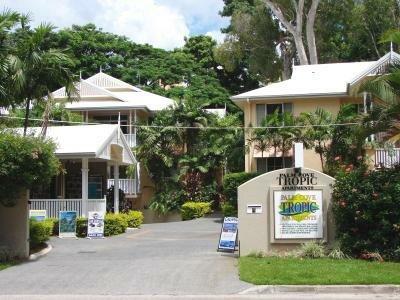 The Palm Cove Tropic Apartments provides both holiday makers and business travellers with discount accomodation. Offering excellent boutique apartment accommodation in Palm Cove, Far North Queensland, Palm Cove Tropic Apartments is located an easy 20 minute drive north of Cairns International Airport and is an ideal base from which to explore all that this tropical region of Queensland has to offer. Nearby Attractions : Great Barrier Reef, Palm Cove beach, shops and restaurants, Kuranda, Atherton Tablelands and Port Douglas are within easy reach of our Palm Cove resort. Elysium Apartments Palm Cove - Luxury holiday apartments combine high style and practical choices for discerning holidaymakers. Located just 200 metres from Palm Cove's beach and esplanade, Elysium's superbly decor make it the choice for the discerning holiday traveler. The Elysium Apartments provides both holiday makers and business travellers with discount accomodation. This Palm Cove accommodation features modern amenities and is close to everything that Palm Cove has to offer. Nearby Attractions : Next door to Elysium, The Palm Cove Tavern offers indoor/outdoor dining and a well stocked liquor store. 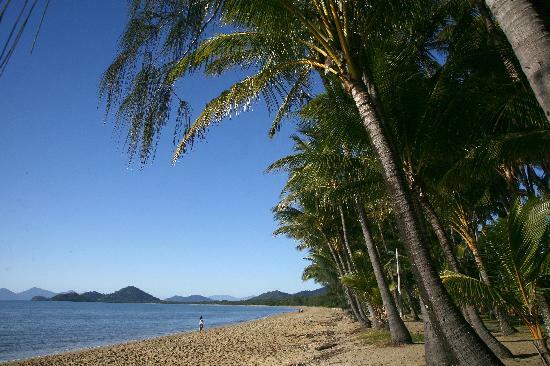 Within the village of Palm Cove, stores and services include a convenience store, a hairdresser, Post Office, rental car hire, watersports hire (kayaks, catamarans and jetskis) and bicycle hire. Picnic tables and free barbeques dot the foreshore. 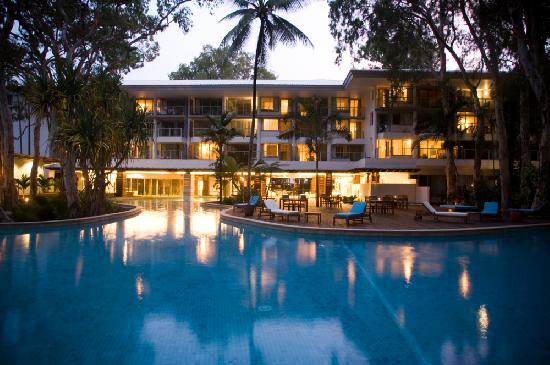 Grand Mercure Rockford Esplanade Palm Cove - Grand Mercure Rockford Esplanade Apartments in Palm Cove Queensland will be the accommodation destination holiday dreams are made of, offering some irreplaceable memories to take home. The Grand Mercure Rockford Esplanade has a number of guests facilities and services including Business Centre, Conference Centre, Direct Internet Access, Faxing Facilities, Free Car Parking, Guest Laundry, Gym, Lift, Restaurant, Room Service, Spa, Outdoor Swimming Pool, Tour Desk, BBQ, Airport Shuttle, Security, 24 Hour Reception and Babysitting Service. Located on a palm-fringed tropical beach with the pristine blue waters of the Coral Sea providing a lazy border where two world heritage sites merge together, the Great Barrier Reef & the spectacular Daintree Rainforest. Nearby Attractions : Dive, Swim or View the Great Barrier Reef, Visit the Sunday Market at Port Douglas, Visit the magnificent Cape Tribulation and Daintree Rain Forest, Shop in Cairns, Take the Skyrail to Karunda or try horse riding. Alassio on the Beach Palm Cove - Alassio on the Beach in Palm Cove provides beachfront studios, 1, 2 & 3 bedroom self contained serviced apartments. Palm Cove and Alassio on the Beach has something to offer everyone. Alassio Palm Cove Holiday Resort Apartments offers a selection of self-contained luxury holiday serviced apartments right on the Palm Cove beachfront overlooking the beautiful Coral Sea. Nearby Attractions : Visit the Great Barrier Reef, exploring the 'World Heritage' listed tropical rainforests, travel inland to the outback, whitewater rafting, hot air ballooning, skydiving, bungy jumping, 4WD tours and much more. For those who want to unwind there are tropical beaches and islands to explore or you can travel on the world famous 'Skyrail' rainforest cableway or the scenic 'Kuranda Train' to explore the wonders of the Atherton Tablelands. Mantra Amphora Resort - The Mantra Amphora Resort provides luxury hotel accommodation, 1 & 2 bedroom self contained serviced apartments located on the spectacular waterfront of Palm Cove's palm-fringed beach. Guests can enjoy an early morning dip in the tranquil Coral Sea directly opposite the resort, meander your way around the beautifully landscaped gardens or bask in the tropical warmth beside the award winning resort lagoon swimming pool and spa. Not only is the Mantra Amphora Resort a great place to stay in Palm Cove but it also has lots of great facilities including lounge bar, direct internet access, free car parking, guest laundry, restaurant, spa, outdoor swimming pool, tour desk, garden, baby cots available, babysitting service and day spa. Nearby Attractions : The Mantra Amphora Resort is conveniently located within easy reach of the Great Barrier Reef with its sailing, snorkelling and glass bottom boat tours, Daintree Rainforest with its huge variety of bird, insect and marsupial wildlife, local markets, atherton tablelands and a la carte or buffet options along the Esplanade and Pier Waterfront. In Palm Cove the village atmosphere of ultimate tropical serenity offers a collection of small intimate dining experiences. There are also many adrenaline activities like bungy jumping, white water rafting, sky diving, cable skiing, mountain bake tracks or even kite surfing. 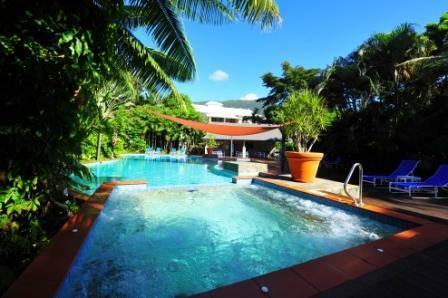 Peppers Beach Club Spa Palm Cove - The Peppers Beach Club Spa Palm Cove provides 5 star hotel accommodation, as well as 1 & 2 bedroom self contained luxury serviced apartments in the heart of the charming Palm Cove village. Overlooking a stunning palm-fringed beach, the award winning and inviting Peppers Beach Club & Spa Resort is the perfect place to indulge in tropical relaxation. Guests who stay at the Peppers Beach Club Spa Palm Cove in Palm Cove will be able to make use of the many guest facilities at the property. These include child minding, conference centre, direct internet access, free car parking, guest laundry, fitness equipment, lift, restaurant, room service, sauna, spa, outdoor swimming pool, tennis court, tour desk, bbq, airport shuttle, 24 hour reception, baby cots available, babysitting service and day spa. Nearby Attractions : Close by to this Palm Cove hotel is the delightful beach and the property is also on the doorstop of the Great Barrier Reef and the World Heritage Daintree Rainforest. Guests can swim and enjoy the sun at the beach or by one of the three pools, enjoy a cocktail or light lunch at the swim up pool bar, stroll along the beach or down to the pier to watch the fishermen or browse the boutique shops around Palm Cove. There are plenty of day tours available to places such as The Great Barrier Reef, Daintree National Park, Cape Tribulation, Kuranda Skyrail and Scenic Train, Atherton Tablelands, white-water rafting, skydiving, ballooning, horse riding, Hartley's Creek Crocodile Farm, Green Island and Fitzroy Island. Villa Paradiso Palm Cove - Villa Paradiso Beachfront Apartments Palm Cove has luxury 1, 2 & 3 bedroom self contained apartments providing discount beach holiday resort accommodation. The Villa Paradiso offers holiday accomodation complete with modern amenities and is close to everything that this resort area has to offer. 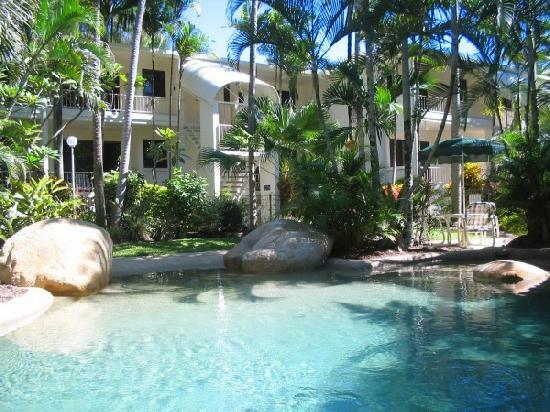 Villa Paradiso Beachfront Apartments are the essence of Palm Cove, just a few metres from the beach and the Coral Sea. Nearby Attractions : Visit the Great Barrier Reef or World Heritage Daintree Rainforest, take a trip on the Skyrail cable car to Kuranda. Just 5 minutes away is The Tropical Zoo and an international standard golf course is within 5 minutes drive from the property if golf is your passion. Otherwise just laze on the beach just a few metres in front of your apartment. 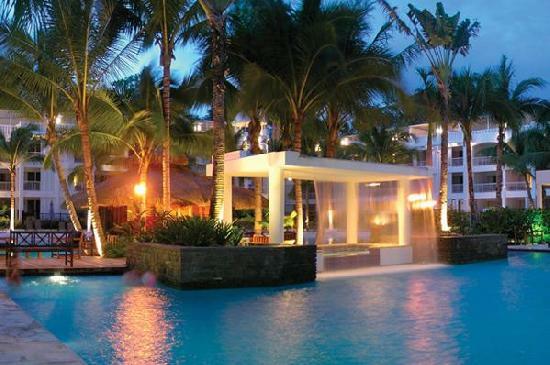 Melaleuca Resort Palm Cove - Melaleuca Resort in Palm Cove has quality 1 bedroom serviced beachfront apartments. The Melaleuca Resort has a number of guests facilities including Free Car Parking, Guest Laundry, Massage, Sauna, Steam Room, Spa, Outdoor Swimming Pool, Tour Desk, BBQ, Garden, Airport Shuttle, Cots Available and Babysitting Service which will make you feel right at home the next time that you stayat this resort. 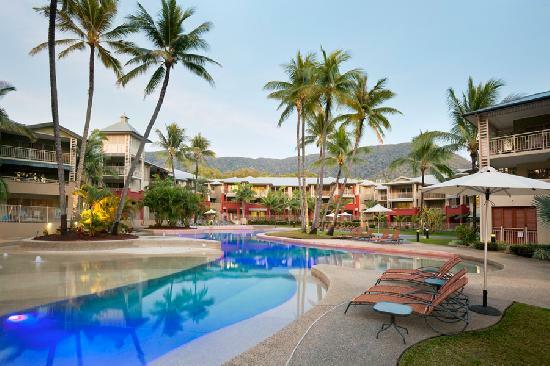 On the beachfront of beautiful Palm Cove is Melaleuca Resort, a small intimate holiday resort offering the the conveniences of home combined with the service and comfort of a hotel, all in a beautiful beachfront location. Nearby Attractions : Daily tours to the Great Barrier Reef, Daintree Rainforest, Atherton Tablelands, Skyrail and train to Kuranda, white water rafting, hot air ballooning, parachuting, sea kayaking, sailing and other water sports. Wild World the Tropical Zoo and Night Zoo, Hartley's Crocodile Adventures, golf, reef, estuary and game fishing, horseback riding, ATV and trail bike trips, mountain bike trips, helicopter tours and much more.